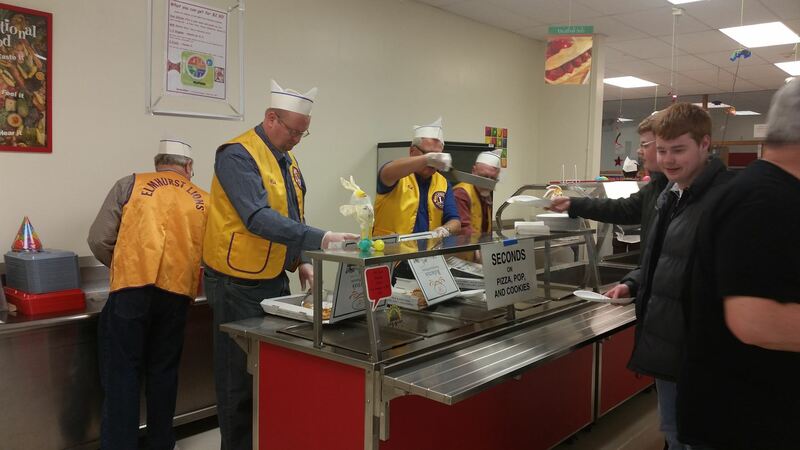 The Elmhurst Lions Club held their 32nd Annual Pizza Party fundraiser at Sandburg Middle School, 345 E. St. Charles Rd., Elmhurst, on Saturday, February 23, 2019, from 5:00 to 7:00 p.m.
Tickets are $8.00 each or a Family Price (5 or more) of $35.00 and children 6 years and under are free! 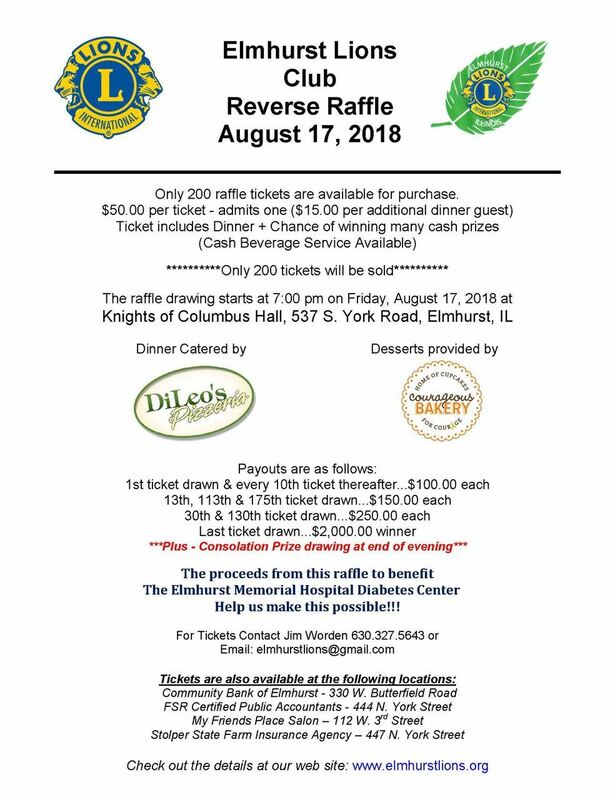 Contact John Wartinbee at (630) 279-5019 for more information and tickets. Again this year’s party will feature Pizza from Robertos Ristorante and includes cheese, sausage, and pepperoni. Remember It's All You Can Eat....So Come Hungry!! The Pizza Party has been a longtime favorite of families in Elmhurst. There will be a 50/50 cash raffle, plus children's and adult raffles with over 100 prizes. The Elmhurst Lions are dedicated to raising funds that benefit local children and adults with vision and hearing needs. Looking for assistance? Please click on the link below for a request form. We had a great turn out, with almost 100 people in attendance. This year's the Grand Prize was split between two lucky winners, each taking home $1,000! The proceeds from this event, roughly $4,000 will be donated to the Elmhurst Hospital for the Diabetes Center. Thanks to everyone for making this another very successful event!!! Take a look at some previous event photo's below!! 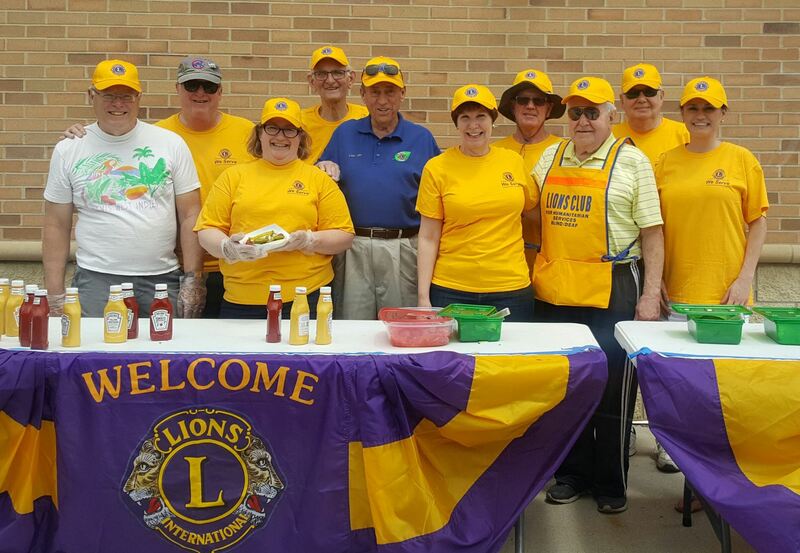 The Elmhurst Lions are dedicated to raising funds that benefit local children and adults with vision and hearing needs. Please browse the pages of our site, and if you would like to become a member of the Elmhurst Lions, please check out the "Join Us" page for membership information. Whenever a Lions club gets together, problems get smaller. And communities get better. That's because we help where help is needed - in our own communities and around the world - with unmatched integrity and energy. Our 46,000 clubs and 1.4 million members make us the world's largest service club organization. Lions club members come together in this humorous hip hop video. The lyrics focus on what wearing the yellow Lions club vest means to the community. and adults throughout the world. impaired because of uncorrected refractive errors (far and near sightedness). Almost all cases can be corrected and normal vision can be restored with eyeglasses, contact lenses or refractive surgery. The lack of eyeglasses denies children and adults opportunities for education, employment and a better quality of life. June 3rd at the Hub Tent at Berens Park. We had a beautiful day and with the help of 12 volunteers we gave away our last hot dog with 4 minutes left for the event. Here is a link to the Independent Article.